Smart WiFi touch control stepless dimmer switch This 1 Gang touch dimmer switch supports maximum power of 400W that can work with most lights with dimming function. This dimmer provides the maximum amount of stepless dimming range, user can dim the light to save more electricity and extend bulb life. Premium quality Made of flame-resistant ABS shell and toughened glass panel that ensures a good durability. Luxury and fashion design that.. WIFI Smart Home Automation Control Touch Wall Light Switch Touch Panel Dimmer. Smart WiFi touch control stepless dimmer switch. This 1 Gang touch dimmer switch supports maximum power of 400W that can work with most lights with dimming function. Made of flame-resistant ABS shell and toughened glass panel that ensures a good durability. Luxury and fashion design that can be well fit into most places with different decorate style. Compatible with Amazon Alexa / Google Home / IFTTT. User can control this stepless WiFi dimmer via voice through Alexa / Google device to turn on/off the light and adjust the brightness. Connect APP with IFTTT, then you can create triggers and actions on IFTTT website/APP and control your lights. These make the operation more convenient and more intelligent. Support timer on/off function and it can set many groups of timer settings. Support network off work function, the timer setting can work as usual even if the network is shutting down. When installing, this Wi-Fi touch switch need to connect to a Neutral line. This dimmer only supports to adjust the light brightness, it can not change the light color. The light connect with this dimmer must support diming function. Type: 1 Gang Touch Wi-Fi Dimmer Material: Flame-resistant ABS, toughened glass Quantity: 1 pc/4/10pcs Item Color: White. Rated Voltage: AC 100V-240V, 50/60Hz Max. Load: 400W / gang (Resistive load) Max. Working Current: 2A Standby Consumption: 0.1mA Wi-Fi: 2.4GHz, IEEE 802.11 b/g/n Wireless Range (the distance between wifi router and dimmer): <30m / 98ft (lndoor) App: Smart Life. OS Supported: Android and iOS Application: LED, Incandescent lamp, halogen lamp Power Supply: Neutral and Live wire Work Environment. 080°C, 1093% Certification: CE, RoHS, FCC Installment Pitch of Holes: 82.5mm (US standard) Size: 127.63.2cm / 4.731.3 (LWH) Net Weight: 0.165kg / 5.8oz. 1Wi-Fi touch light switch 1English user manual 2Screw 1Package box. 1 Gang Touch Wi-Fi Dimmer. 400W / gang (Resistive load). 2.4GHz, IEEE 802.11 b/g/n. LED, Incandescent lamp, halogen lamp. 127.63.2cm / 4.731.3 (LWH). 0.165kg / 5.8oz. Because transit time is highly dependedand provided by Postal Service. Return is accepted within 7 days of receipt after you fully explain the problem. We have a specialized customer service team eagerly waiting to assist you and ensure that you're satisfied. We will provide professional and reasonable solutions for you. As the left picture shows, then it will come up with several topic as the below picture shows. Second, please pay attention, please just select. As the below picture shows. This Is the best and fast way for both of us to sort out your issue, I will provide you the best service and solution. Thank you for your cooperation. 5pcs Refillable Reusable Coffee Capsule Filter For Nespresso + Spoon. US/EU Plug USB Wall Charger Power Adapter For iPhone Samsung Glaxy Multi-colors. Solar Power Panel Lamp LED Outdoor Street Wall Street Lamp Induction Light. 20PCS Re-usable ELECTRODE PADS Message Electrode Tens Units Musle Relax 4x4cm LB. New Qualcomm Certified QC3.0 Quick Charge With Dual USB Port Fast Car Charger. Solar Power Light PIR Motion Sensor Wall Lamp Night Light Yard Hallway Landscape. Quick Charge QC2.0 Dual USB Car Charger Quick Charge Adapter DC 12-24V 2.1A new. Oil Sprayer Dispenser Portable Olive Stainless Steel Grilling Cooking Oil Bottle. 3A 2 Ports LED Display QC 3.0 USB Car Charger for Smartphone Tablet. 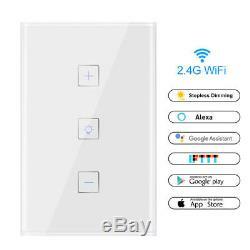 The item "WIFI Smart Home Automation Control Touch Wall Light Switch Touch Panel Dimmer" is in sale since Friday, March 23, 2018. This item is in the category "Home & Garden\Home Improvement\Electrical & Solar\Switches & Outlets\Dimmers". The seller is "lemon-best2012" and is located in Hong Kong. This item can be shipped worldwide.